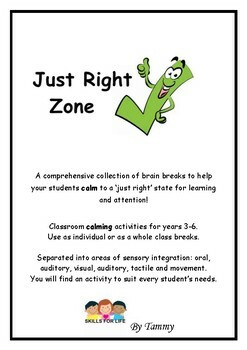 A comprehensive resource for teachers 3-6 to incorporate self-regulation activities into their daily classroom routine. This set of brain break ideas can be used by your whole class or individual students. These calming breaks help students to slow down when their body is running too fast. This collection includes calming ideas across all sensory input areas including oral, visual, auditory, tactile, smell and movement. There is a sensory purpose behind every activity, they are not simply movement breaks and offer an extension on traditional movement brain breaks. An easy to go to guide that includes some QR codes. Print off and keep handy for easy reference. Color coded for ease of use. Our bodies can be in three states, too fast, just right, or too slow. All students need to have self-regulation activities to enable them to attain, maintain and change their level of alertness for focused, productive, independent learning and appropriate interactions with others to occur. 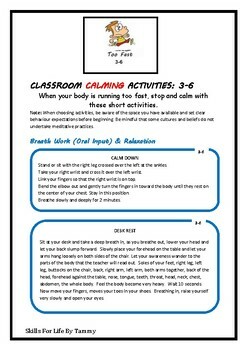 Use these activities to assist students to return to a calm state of being after they have been hyped up, just returned from a break or during transitions. Perhaps your class is really fidgety or unable to focus. Use them at anytime during the day when you feel your students need to calm (slow) their bodies down.